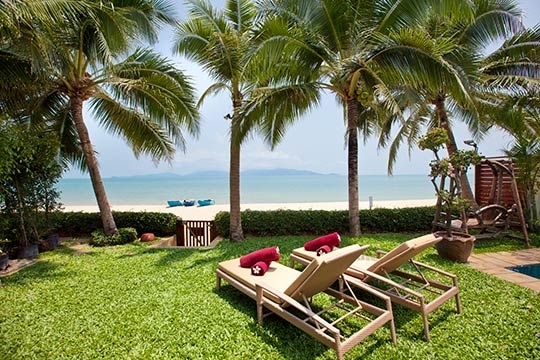 The eight villas of the exclusive Miskawaan Estate offer enviable luxury alongside tranquil Mae Nam beach on Samui’s north coast. 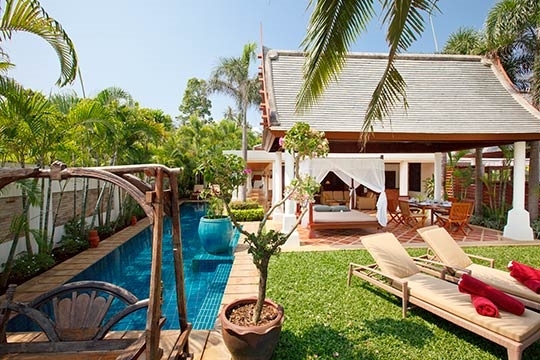 Four-bedroomed Bougainvillea rests beside the sand-swept shore, with the warm, eminently swimmable waters of the Thai Gulf just a few steps from the villa’s entertainment areas. Views stretch across to the island of Koh Phangan and boats sail by offering an ever-changing ocean vista. But this breezy outlook doesn’t compromise guest privacy: neighbouring villas are discreetly screened by walls and tropical foliage, and a slightly raised garden means that the beach and ocean can be seen from the villa, but not vice versa. Villa Bougainvillea’s four bedrooms all slide open onto the garden, while the narrow but long blue-tiled pool lies towards the front of the property, adjacent to a patio with bar and sitting area. It’s a pleasure to drift between rooms, pool and beach during the day and gather for meals in the dining sala – ocean on one side, swimming pool on the other – in the evening. 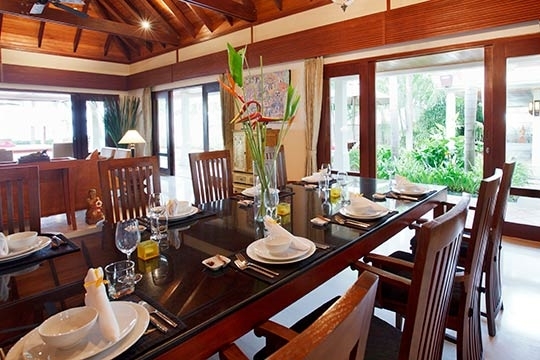 A 10-seater table in the open-plan living pavilion makes an alternative air-conditioned dining venue; meals served from the adjacent, fully fitted western kitchen. The helpful villa manager is always on call and visits every morning to discuss meal arrangements (breakfast is included and other meals are charged according to grocery costs, plus 30% service). 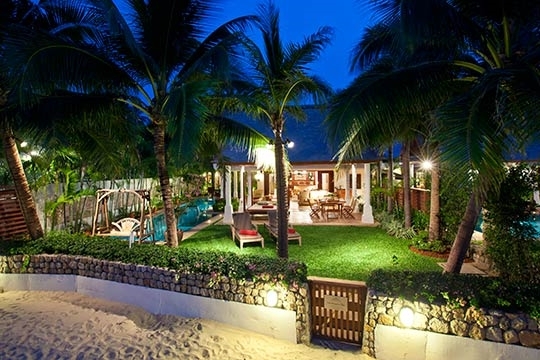 The varied in-villa menu includes a good choice of Thai and western dishes, so eating out is by no means a necessity – although several restaurants are within walking distance along the beach. Being part of the fully managed Miskawaan Estate, Bougainvillea enjoys regular attention from the security and maintenance teams, and an English-speaking estate manager is available to give holiday advice, make recommendations for excursions or help with practical requests. Mae Nam beach lines one of the island's largest bays and is much quieter than the beaches on Samui's more developed east coast. This makes Villa Bougainvillea a particularly appealing option for those who prefer to disappear into their own private world. 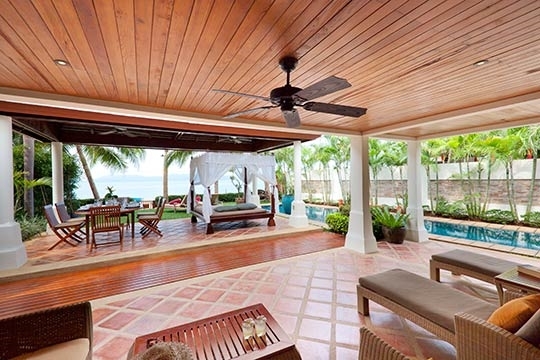 Enjoy a pristine beach and sunset views from this peaceful sanctuary. 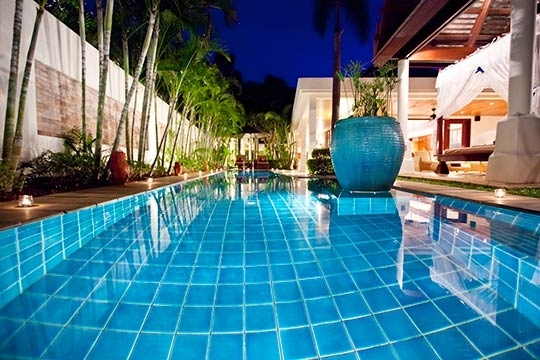 Villa Bougainvillea is part of the exclusive, eight-villa Miskawaan Estate. 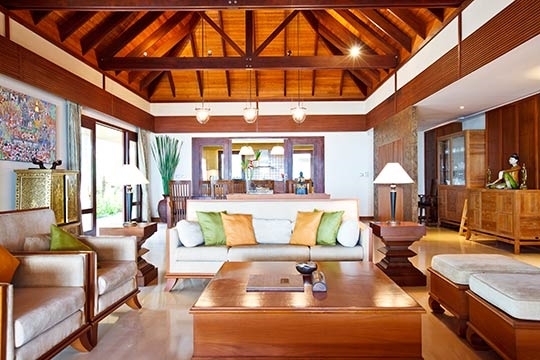 The other villas on this beachfront estate are four-bedroomed villas Hibiscus and Acacia, and five-bedroomed Waterlily, Gardenia, Frangipani and Champak and Lotus . 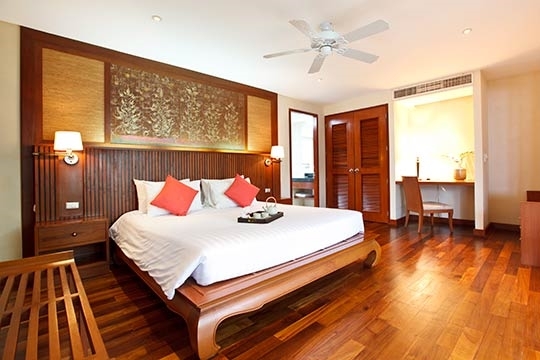 All the villas’ gardens open onto a quiet section of Mae Nam beach, with Hutcha and Hammock resorts a few hundred metres to the left, and local eateries only a short stroll along the sands. This part of the beach is never crowded, although the occasional tourist may wander by. 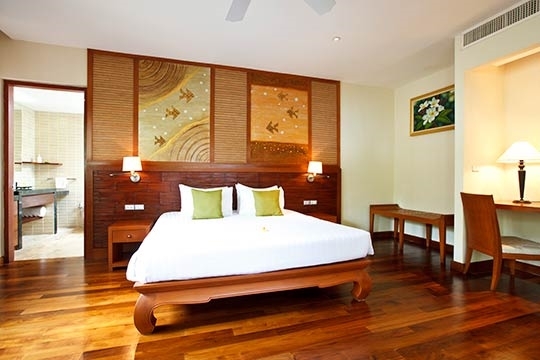 The villas at Miskawaan sit side by side, but are hidden from one another by walls and tropical foliage so you feel pleasantly cosseted, while still benefiting from a range of 24-hour on-site services. The village of Mae Nam offers a selection of local shops, restaurants, bars and modest tourist services such as foot massage, water sports and a pharmacy, while more cosmopolitan Chaweng is only a 15-minute drive away. Four-bedroomed Villa Bougainvillea is the smallest of the Miskawaan properties and is ideal for a family or intimate group. 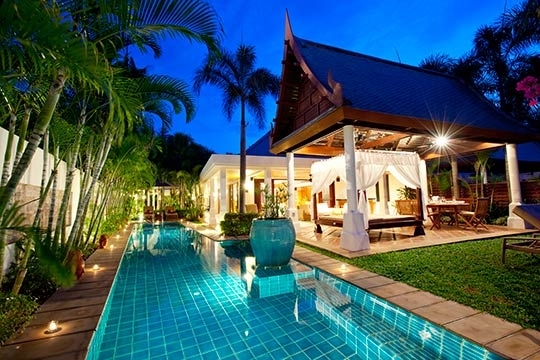 The villa is sensibly laid out to make the most of its more diminutive size. A private road backs the Miskawaan Estate's eight beachfront properties, each of which boasts its own parking area. 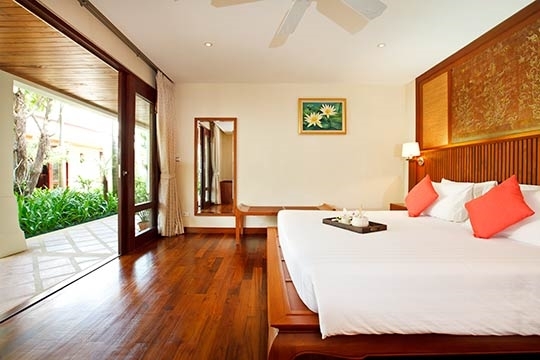 To the left of the villa entrance, the king-bedded master suite offers privacy in its own pavilion. Three further bedrooms (two king and one twin) lie opposite the living pavilion across a lush garden area planted with towering palms. 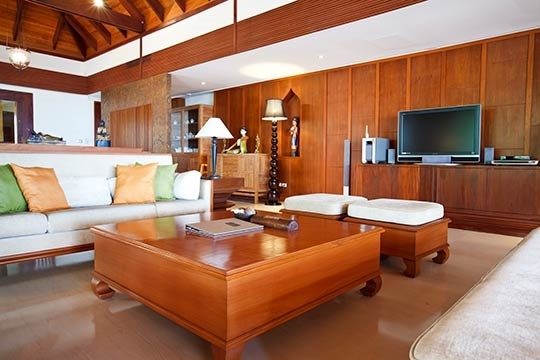 All four bedrooms have vaulted timber ceilings and are tastefully furnished with teak furniture and Thai artwork. 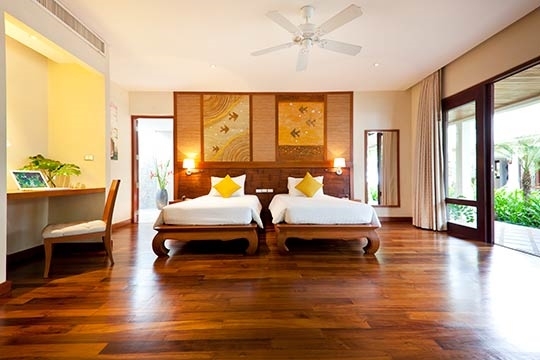 Each has wooden floors and features plenty of built-in storage. However, only two of the rooms have TVs. 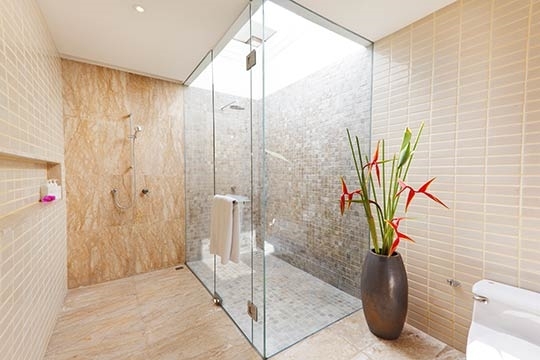 The ensuite bathrooms are fitted with glassed-in rain showers, while the master bedroom also boasts a bathtub. 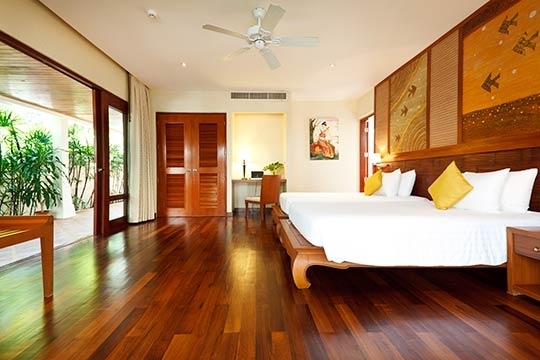 Low-noise air conditioning, ceiling fans and blackout curtains guarantee peaceful sleep for every guest. 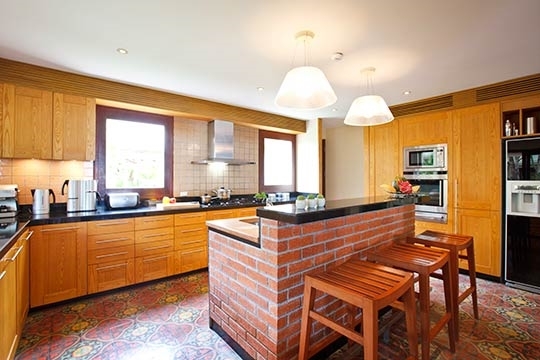 To the rear of the living pavilion is a chefs’ dream kitchen, which is open-plan to the air-conditioned dining room and a lounge furnished with comfortable couches positioned to face the satellite TV/DVD, located in a wooden feature wall. Sliding doors from the living pavilion open to a fan-cooled patio equipped with a built-in bar counter and furnished with cushioned rattan couches and two loungers. 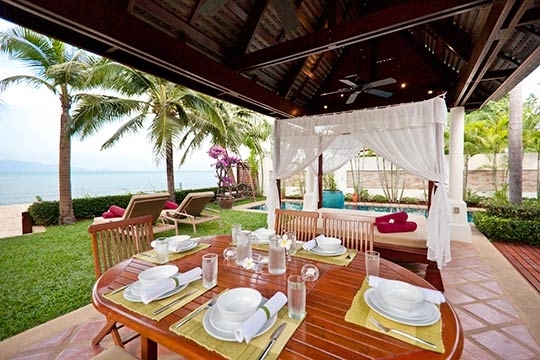 Beyond this patio a breezy sala overlooks the beach and offers semi-alfresco dining at a six-seater round teak table. 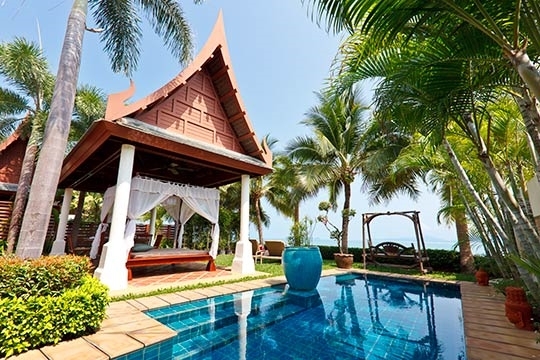 A canopied daybed makes a great place for a massage, while two sun loungers and an ornate wooden swing bench are perfectly positioned to watch the world go by from the lawn overlooking the sea. 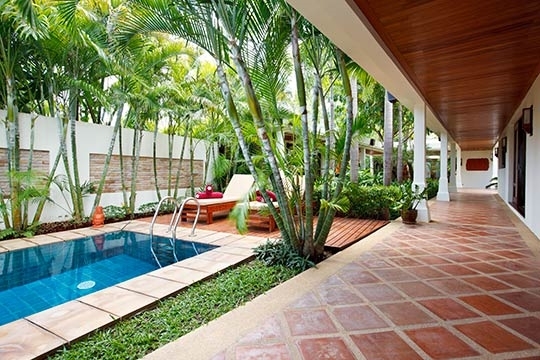 4 bedroom villa located in Mae Nam, Koh Samui. Ideal for Beachfront, Body and soul, Bring the relatives, Kid friendly, Going for golf, Fair share for groups, Sensible for seniors, Room with a view, Walk into town, Perfect for weddings.